LMN Architects is pleased to announce the completion of the new Downtown Seattle Hotel. The project is a full-service hotel and meetings venue managed by Hyatt Hotels composed of 1,260 rooms, and numerous amenities including ballrooms and restaurants. The design synthesizes a variety of urban influences and scales into a mixed-use architectural collage inspired by its position at the intersection of Seattle?s primary commercial and high-rise residential neighborhood adjacent to the new Washington State Convention Center Expansion. The new Downtown Seattle Hotel is a contemporary composition of pure geometric forms hovering over a transparent and inviting street-level public space at the base of the building. 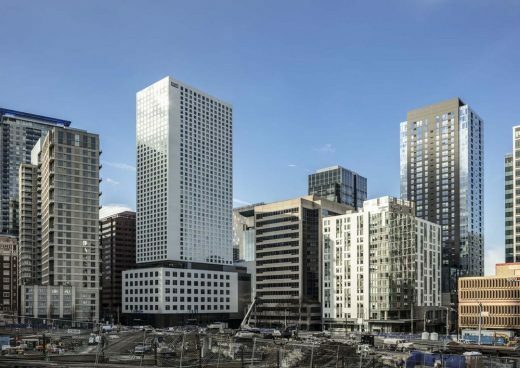 The building supports an engaging interplay between the community and the vast influx of visitors, while anchoring the rapid northward expansion of downtown?s urban fabric.